the scent of green bananas: name that fruit! 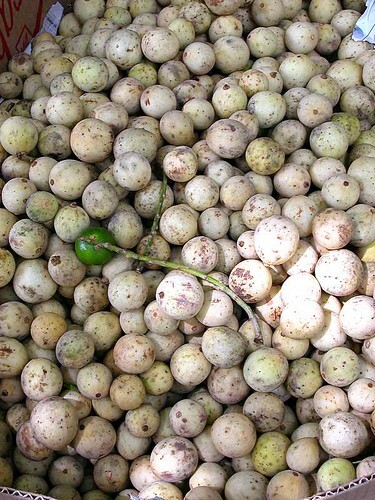 : lanzones. Posted by santos. This entry was posted on 20090812 at 3:41 PM You can skip to the end and leave a response. i love it almost as much as mangosteen. buah duku? cool name! the ones from bangkok are sooooo good. hi santos!I just arrived at your blog!! very nice of you to parade all of asia's delicacies!! clavriene, thanks for stopping by and taking the time to comment. you are so lucky to have buah duku in abundance right now. i miss malaysia, i want to visit again! in malaysia, the thick-skinned ones are duku n thin-skinned ones are langsat.love them. I've never heard of this fruit! Thanx for sharing LANZONES! uhm. How do I get some of this goodness in LA? I know where to get mangosteens but.. holy cow that looks good. And will you ever go back to 3rd/Fairfax? Here in Hawaii that's longon, if I'm not mistaken, but a different color. hi claudia! thanks for stopping by. 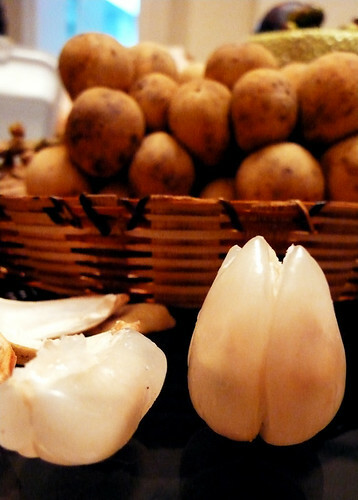 longan are similar, but different in that there is a central seed and it isn't segmented. also, the longan's flavour is more sweet than the sweet-sour taste of the lanzone.